Lori's behind the counter every day of business. One of the risks of traveling Monticello Road by any mode is that it is very difficult to get past Spudnuts without stopping in for one of their golden delights. The place is strategically sited; right on the way into town and it casts an aroma that beckons like a siren’s song. Their under-a-dollar treats always live up to expectation. I’ve always known there was something special about the place—even way back in the eighties when I first started coming here—and it’s apparent from the outside. With the ring of the bell as you walk in door, the sense becomes unmistakable. The yumminess of the doughnuts and the allure of the place derive from much more than the sum of the somewhat unconventional ingredients. As I spend time with Lori and her family (who are always there) it has become clear that their personalities are what makes the place so special. It pervades everything about the place: the décor, the arrangement of the tables, and the food itself. The room nearly bursts with a combination of love and integrity. It’s honest, modest, reliable, a little bit quirky and it feels like home. These adjectives also describe the product and the people on both sides of the counter—staff and customers. They’re making the world better simply by being in it, working hard and putting out a lot of love. Lori said of my project, “People like it because it’s a positive thing that brings people together in a difficult time. They can see that you’re sacrificing and putting a lot into it and they respect that.” Those words actually describe her own enterprise quite well and it explains why we all love the place so much. 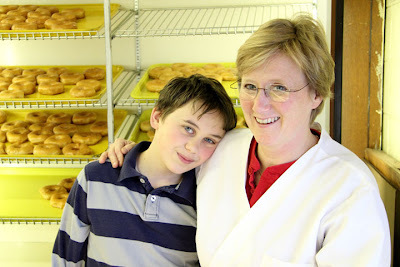 Spudnuts is a treasure and has been for generations. They are a very good example of what makes a community work and a place special. Spudnuts is located at the corner of Avon and Monticello Road, Charlottesville VA.